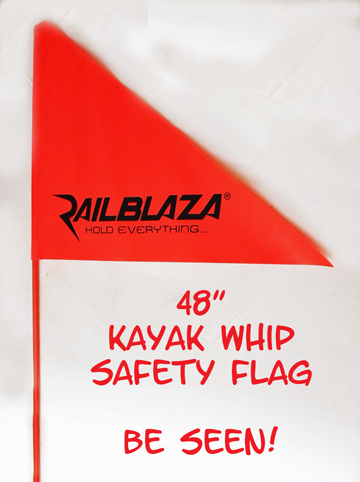 The Railblaza 48" Orange Kayak Safety Flag should be an important consideration on every kayak. 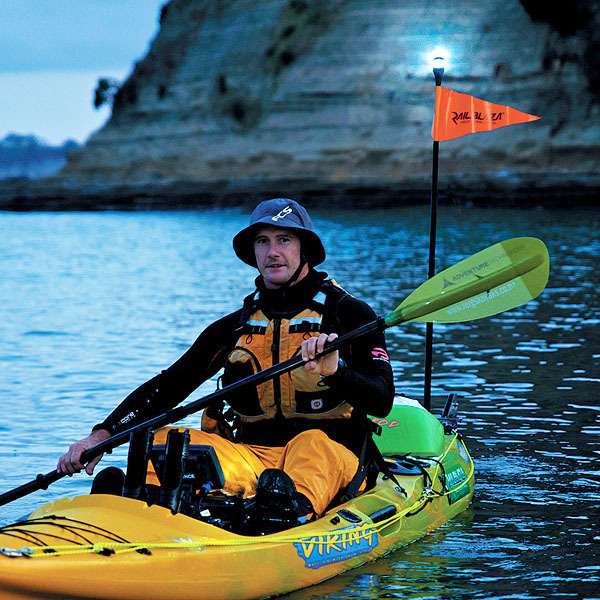 Kayak visibility is something that should never be taken for granted.Be seen day and night! Now you can choose between a "Flag with Light" "Light Only" and "Flag Only"! 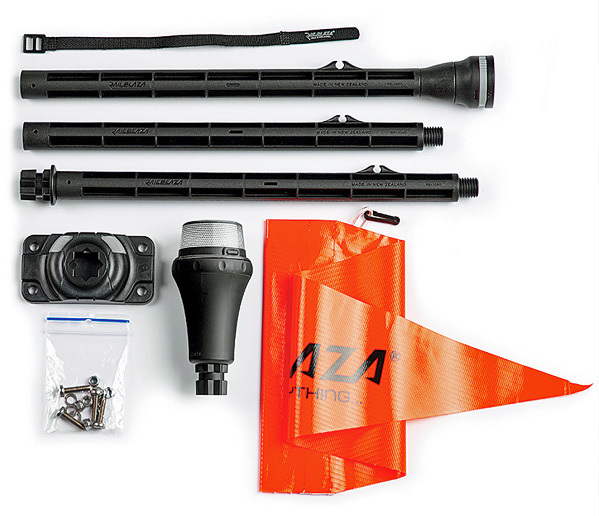 For Day and Night Visibility! 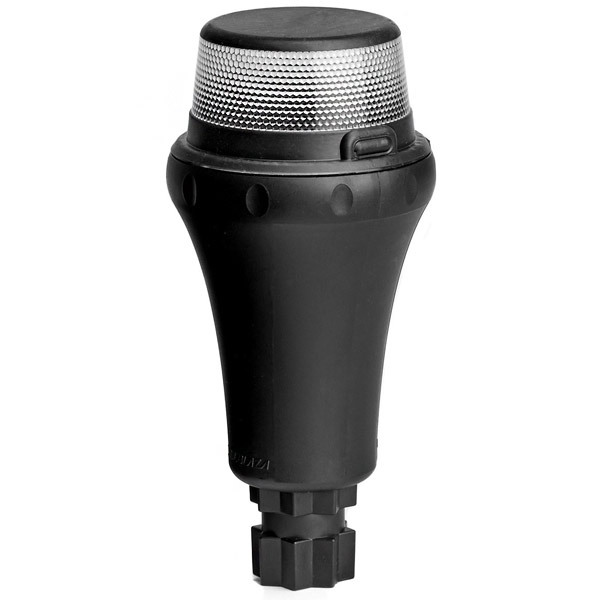 Light Features for "Flag with Light" as well as "Light Only"
Light Can Be Removed and Replace with Camera Pod, Etc. 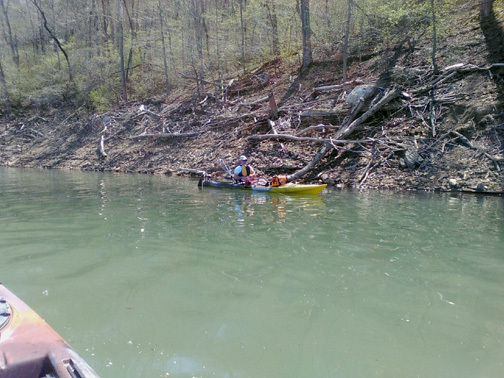 Kayaks are being used on rivers, lakes, streams, and even the Gulf and Oceans. While narrow rivers and streams do not pose much of a visibility problem large bodies of water do present visibility problems. 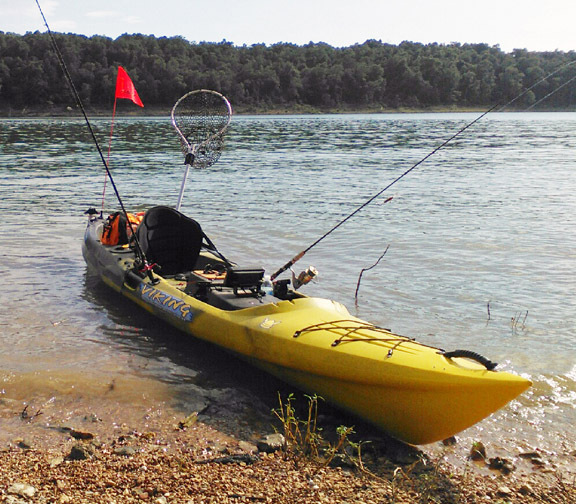 On lakes and larger waters that are being shared with large, fast boats, everything you can do to be seen is to your advantage, including using a kayak safety flag. 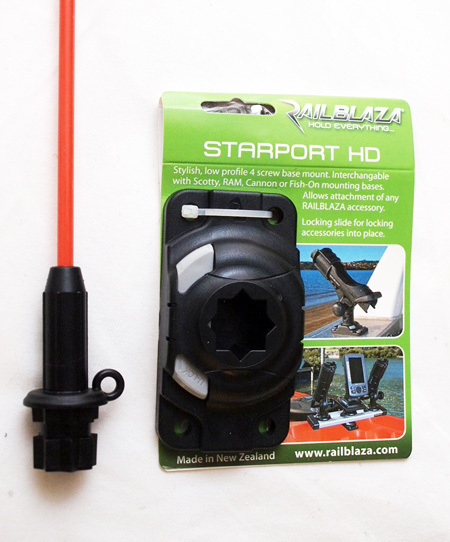 Kayaks are made in many different styles and colors these days. Many of those colors are a mixture of several different colors. While they are beautiful to look at the patterns help break up the shape of the kayak at distances. Dark colors, earth colors (yellows, greens, browns, etc) and blue and white blended colors tend to blend in with the background. I will show you what I mean. I am a dealer for Viking kayaks. So one of my kayaks is a Viking Profish Reload in a yellow,green, black color mix. It is really pretty, but in the spring when all the blooms and yellow green leaves are sprouting along the bank my kayak can be very difficult to see. In the picture above, my viking kayak, even at less than 100 ft away is just beginning to blend in with the background. This was taken in early spring. Later in the year the bank if filled with greens and yellows and blacks. My kayak would be almost invisible. 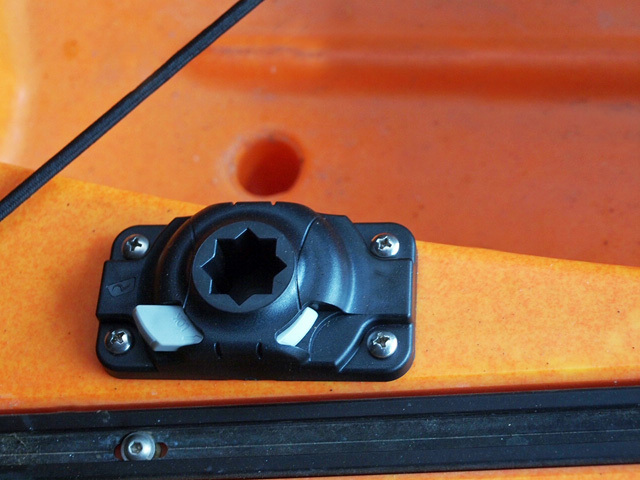 An orange kayak safety flag is not a natural color and would help in visibility. I fish mostly lakes and I often have to cross the lake to get to the other shore. That means I have to paddle across the path of larger boats and jet skis. 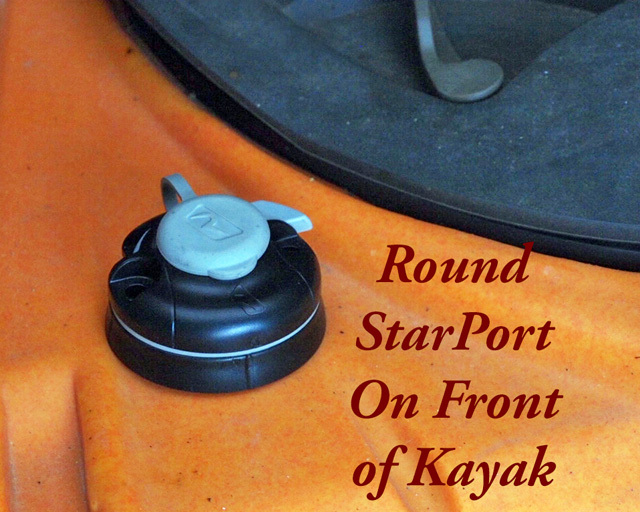 You need to be aware that darker colored kayaks (reds, browns, etc) look dark grey from a distance. My wife has a red, white, and black kayak and at 100 yards it is dark grey. When she is along the bank, even when I know where she is, I have a hard time seeing her. When crossing the lake a dark grey looking kayak blends into the grey/blue looking water at a distance. The first thing I see when my wife is paddling across the lake is her white paddles. Once I see the white paddle going up and down I can then make out the kayak. If a boat speeding along at 40 mph and is 300 yards away and a gorgeous babe in a bikini catches his attention, he can be one top of your kayak before he even knows you are there. If he never saw you to begin with because you blended in with the background he would have no reason to keep an eye in your direction. Every year kayak fishermen disappear on the water. 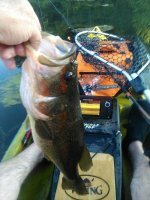 I followed a few stories of people who disappeared on the Gulf while kayak fishing. No trace of the fishermen were ever found and it is left to the imagination to figure out what happened. One thing is for sure, none of those who disappeared had taken measures to make sure they can be seen. We will never know if that played a factor, but why take a chance. You can never over do it when it comes to being seen. It is a matter of safety.